Sam's height advantage became obvious in the fighter-ref talk prior to the action starting, and James knew he would have to chop him down with low kicks, or work close boxing. The fight began at a fast pace, with Doolan using fast footwork to work around his opponent. Both lads were throwing strong hands, with James working well on the inside, moving between knees and boxing in the clinch. A strong right from Bawden forced James to up the pace, and he landed a cracking overhand right, resulting in an eight count. The bell went, and unknown to the Caley corner, James had opened up a bad cut above the eye of the Wicker fighter. Sam's corner had no option but to retire Sam before the 2nd round, to avoid further cut damage. It was slightly disappointing for both fighters as it was shaping up to be an excellent fast and well skilled match. Respect to the Wicker corner for protecting their fighter. 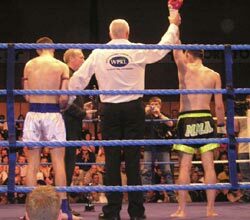 1st round TKO to Doolan. Trish was fighting local girl Lisa in a well rounded match, with both girls throwing and taking hard shots. The first two rounds saw Trish move forward, forcing Lisa to fight off the back foot. She did this well, showing her skill as a counter fighter. Trish made good use of her kick catching skills, sweeping up Lisa's body kicks, and delivering right crosses. The 3rd round saw both fighters using the ring well, neither being able to pin down the other, and although Trish had pushed forward, Lisa was throwing more accurate combos, resulting in a hard fought points decision to the Altrincham fighter. Trish showed vast improvement since her last fight, and has proved she is up to the task of taking on Stacey Butler in June. Read about the rest of the event on the Ax forum.